Tacke was speaking as part of the event ambassadors panel during the opening session of the conference. He said the key to unlocking the vast sums required to fulfill the energy transition over the next decade was to show investors the money was being "well spent". "We are an attractive industry. We need predictability and the money will come," Tacke told delegates in Bilbao. "There is enough money. What they look for is the right project that gives them confidence the money is well spent. "These investors want to see a secure revenue flow out of the opportunities," he added. Tacke said the traditional investment profile of a renewable energy asset — where there is the early investment in setting up the project and then the costs are recovered over the lifetime of the project — was particularly of interest for pension funds, which have a longer-term outlook. "[Their feeling is] as long as the wind blows the revenues will come," Tacke added. "[From my conversations with investors] I hear the funds can be provided. What the industry needs to do is build projects that have a visibility of long-term predictable revenue." Tacke also said the industry required the long-term visibility to be provided by governments. He said the EU-mandated target of 32% renewables by 2030 was a "starting point", but the industry would look at the national energy and climate plans of each country to determine where to invest. "There’s still some work to be done. The industry needs to know what countries plan to install and at what volumes. Industry will continue to look at climate plans, and that will inform investment decisions. "If you don’t have long-term perspective, how can you create jobs, how can you tell people they've got something to engage in and that they have long-term job security?" said Tacke. "The boom-and-bust economies in Europe and the US are not helping the costs [of wind]," said Tacke, adding that the repeated ramping up and down of manufacturing costs money. There is need at government level to have a cross-party long-term plan for energy and renewables, he said, highlighting the UK offshore sector as a good example. It also gives employees motivation as they have something to engage with. "There is a willingness to invest in renewables [in the UK]," Tacke said. 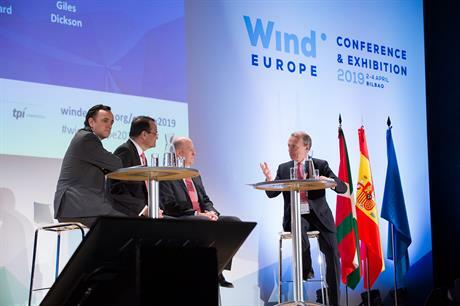 Prior to the event ambassadors panel, the new WindEurope chairman, Vattenfall Wind’s Gunnar Groebler, told delegate the industry in Europe "has a chance to pave the way to the global energy transition". "We have a chance to show the young generation demanding climate action there is a good future for them," he added, referring to the repeated School Strike for Climate protests that took place across Europe in March, spearheaded by 16-year old activist Greta Thunberg.